...Sorry, this isn't a recipe post. Things are completely insane at the moment, and the only thing I had time to bake on the weekend was this little edible bouquet which I made as a thank you present for my wonderful wedding dress designer, Rhonda Hemmingway. People won't see the dress until this weekend but Rhonda and her team have been so incredibly lovely and made the entire wedding dress process completely stress-free that I wanted to make sure I did something special for her. 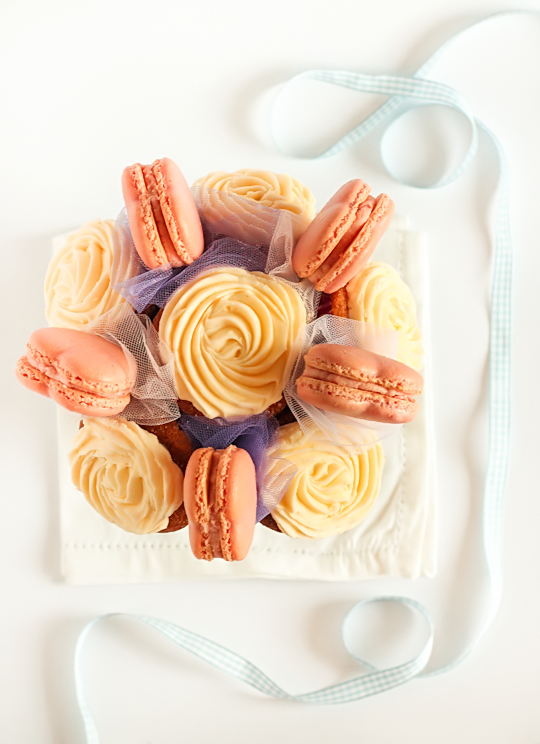 I made the same blueberry cupakes as these ones but added lemon juice instead of vanilla bean to the icing, and used this strawberry jam buttercream to fill the macarons. Unfortunately with my parents in town and all the wedding and work stuff I was doing at the same time I barely managed to find the time to do it, so it was a total rush job and not my best effort ever. I managed to waste an entire batch of cupcakes because I used plain flour instead of self-raising flour by accident (yes, I would be THAT person if I was a contestant on Masterchef). And the macarons were a little overcooked but hopefully they still tasted great after a day or so of maturing in the fridge. The tulle netting and pinks is all a little too girly for me, but it seemed appropriate considering the circumstances. I used a cute little bucket that I got from Victoria's Basement, placed a styrofoam craft ball inside and used some wooden skewers to secure the cupcakes and macarons in place. Originally I wanted to make a batch of my salted chocolate chip cookies for the bouquet as well just to make it a little more fun, but after wasting all the time and ingredients on the first batch of fail cupcakes I decided to settle for just the macs and cupcakes. Anyway, I figured I might as well share it with you, since it was pretty easy to put together and a great little present you could give to anyone. I wrapped up the whole thing in clear cellophane with ribbon to protect it and hold it together while I was transporting it. She absolutely loved it! 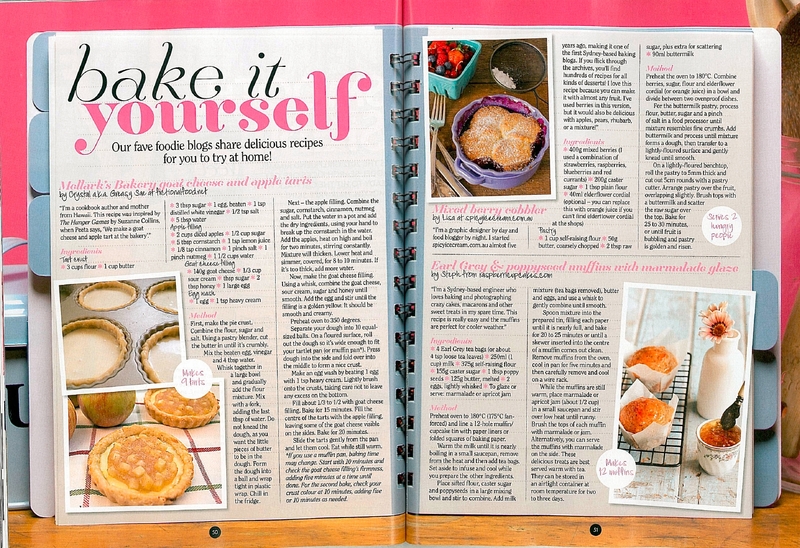 In other news, I thought I might share some of the lovely little mentions and features that I've had in a few magazines and newspapers around the place. It's always exciting and humbling to get a nice blurb printed up! 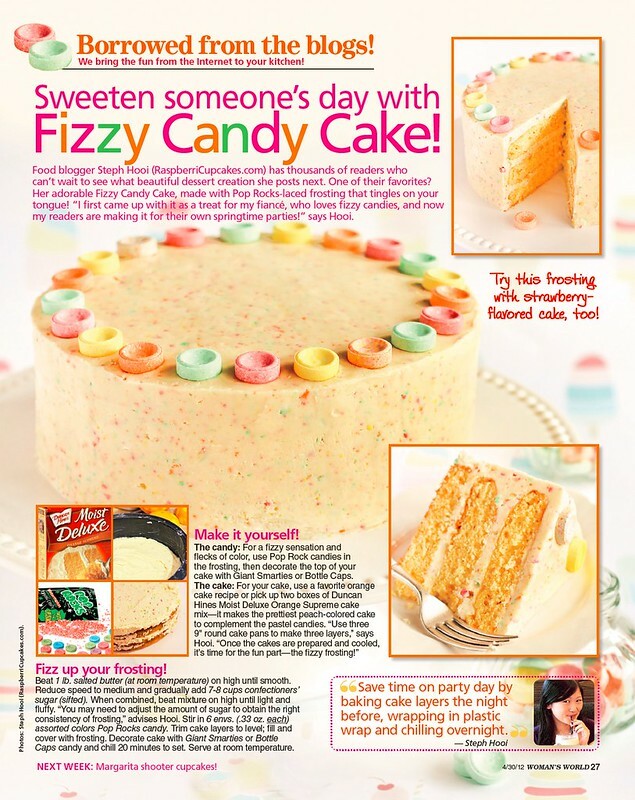 The first was Woman's World in the US who featured my Fruit Tingles Cake (although they incorrectly suggested using popping candy instead of all the other fizzy sherbet lollies I mentioned were available in the US, and I eye-twitched a little at the photo of the box of instant cake mix which they included but no biggie), Girlfriend Magazine included my Earl Grey & Poppy Seed Muffin recipe in this month's issue (June 2012) right next to Lisa, yay! 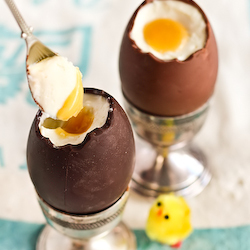 Also there was a really lovely description in last month's issue of Jamie Magazine (Issue 27), and a teeny tiny mention (more of a mention-let) in the UK Times newspaper last month with a photo of my cheesecake-filled chocolate easter eggs. 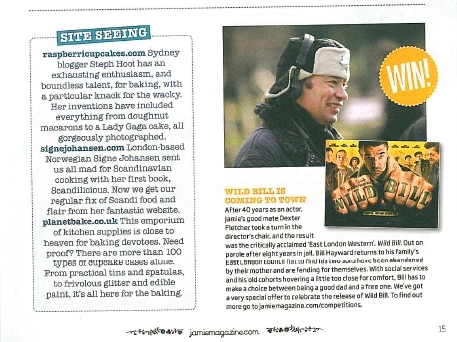 Big thanks to Kate from the little loaf who let me know about it and got her Dad to scan it for me, so sweet! squee less than a week to go!!! that bouquet is gorgeous and congrats on all the mentions! Congrats on all the mentions! The bouquet is such an original, very very pretty! Yay on the global mentions! I just picked up the Jamie mag on the weekend but haven't read it yet, so your blurb is something to look forward to. What a lovely bouquet ! Congratulations! You deserve all of them and great pleasure to follow you. Congrats with both getting married and the publizies! That the most wondeful bouquet I had ever seen, so genius! That is just gorgeous! Congratulations! Oh Steph! Perfect bouqet for you! 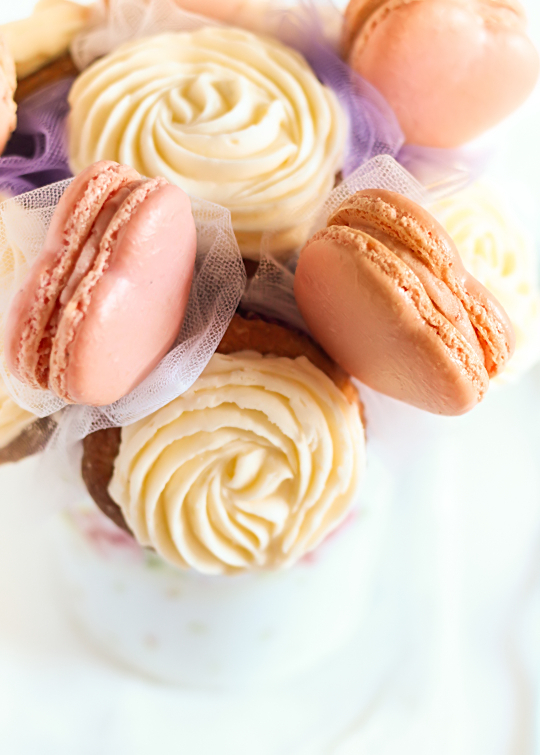 I'm having a chocolate or macaron one when I finally get hitched. whenever that will be! 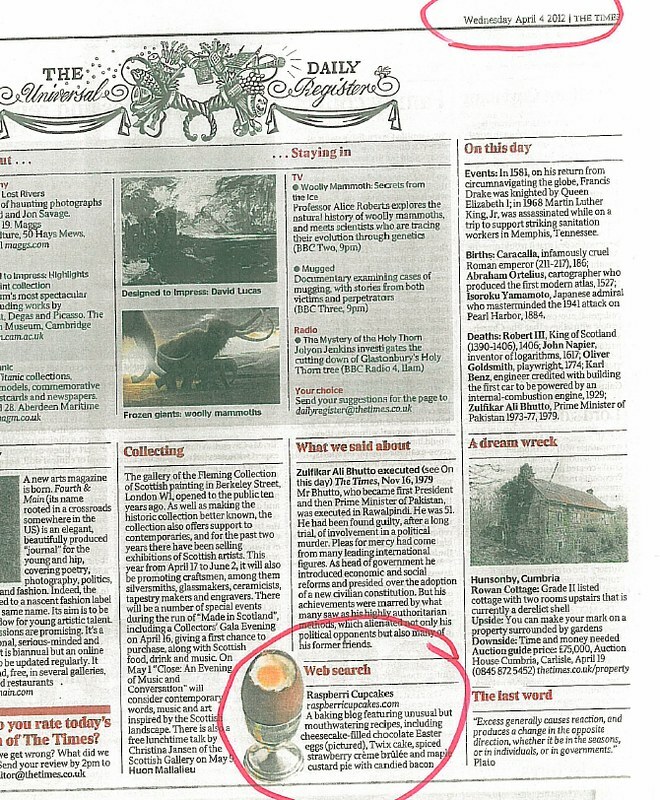 And no worries about the clipping - I love that my Dad spotted it! I live in Canada and started following your blog a couple of months ago. It's beautiful and inspiring. I think it's amazing the way you think a batch of macarons are a straight forward thing to make - I'm not there yet in my skill level. Best wishes for a wonderful wedding and even better marriage. Wow! Not only are you getting married and making lovely bouquets for your dress designer, but you are getting famous, too, with all of those mentions. Congratulations! 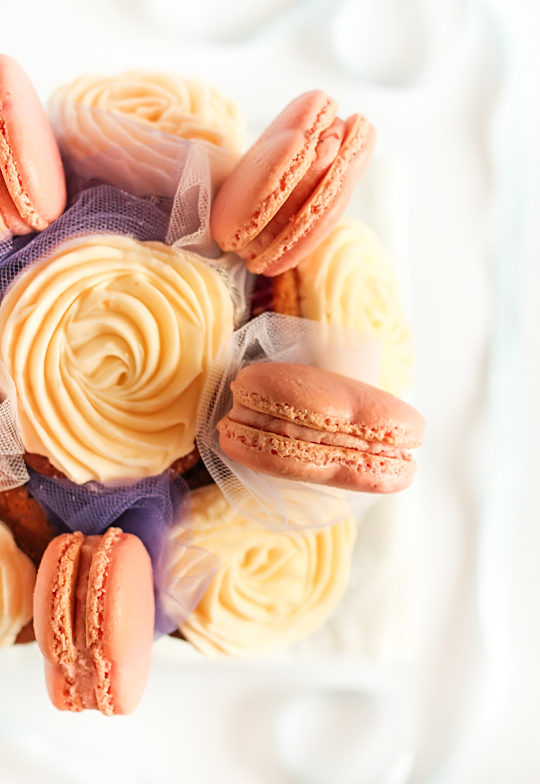 Steph the cupcake/macaron bouquet is just beautiful. And you stated it's not your best work because you rushed? Are you serious? 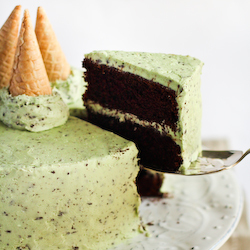 Even if you rush, you create some amazingly beautiful sweet treats. A huge congrats on making it in all those magazines too. What a huge achievement for you. I'm totally digging that fizzy cake. I was initially thinking I couldn't make it due to country differences in sweets but they sell those fizzy sweets you used here in the UK. They're called 'Refreshers' and are the exact same thing. 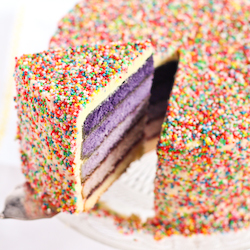 Soooo excited to try this cake now! Thanks for sharing. not surprised you've had all those mentions. You are very skilled and your photos are always breath-taking. I too can't wait to see your dress ! Congratulations on the media frenzy :) It's little wonder, given how delicious and well-presented your baked goods are. 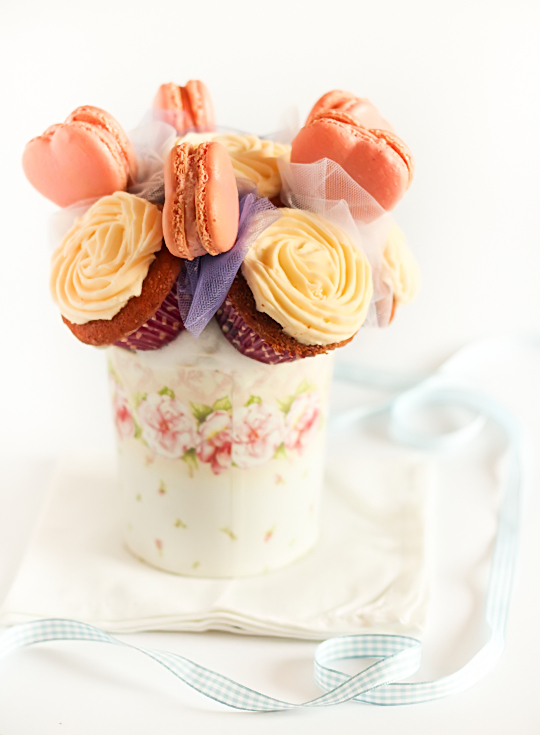 And I love the idea of a cupcake/macaron bouquet! Can't wait to see the dress...The bouquet is so amazing! I know everything will be completely wonderful on your big day! Enjoy! the bouquet is so pretty and cute! and congrats on all the magazine/newspaper features! steph, have you ever tried making cake pops? i would like to see how you'd go with them! Once again a great blog post. 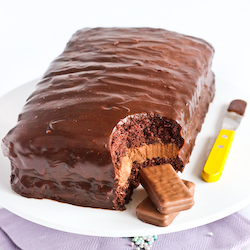 I have only recently discovered your blog and am loving the recipes. Going through the archives and can't wait to get some baking under my belt this weekend. I will be making something and toasting you every happiness for your big day. Congratulations!!!! I love your blog!!!! And your recipes!!! !